Kids actually enjoyed some of the activities when we were in Japan. 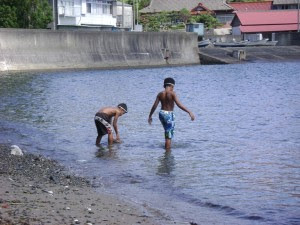 We were right by the beach…so they went to swim almost everyday. It wasn’t too deep so I did not have to worry about them swept away. Other kids were friendly. Once they realized that my kids were speaking English, they tried to speak some English words. It was fun. Some days they were swimming together even though they did not speak each other’s language. I would like to visit sometime again. But next time…we will stay at a hotel.